Completely change the way you feel and move, getting you back to the life you want to live in 12 weeks. Whether you are 35 or 75 your body shouldn't prevent you from playing hard. Overcome pain and dysfunction, develop mobility, athleticism, and body control through our FRC® Package. Get back out there and do the things you love: bike, climb, golf, ride, roll, hit, run. It doesn't matter if your issues come from overuse, neglect, surgeries, or past injuries, 12 short weeks is all it takes to keep you living your life the way you want to live it. FRA® is for anyone who values physical activity and health. It is our first step in building a personalized movement program that is tailored to your body and lifestyle. We test every major joint in your body for passive and active ranges of motion. FRA® quantifies the movement in your spine, hips, shoulders, scapula, great toes, ankles, knees, elbows, wrists, and fingers. This process reveals where joint immobility is causing your body to move unhealthily. These measurements give us the correct starting point to build your movement program and a baseline to track your progress. You took the FRA®, now it is time to begin your 12 week Functional Range Conditioning® program. There are several options available depending your FRA® findings and your lifestyle. After 12 weeks you will be moving better, playing harder, and have the knowledge necessary to keep yourself that way. One-on-one training will correct pain and dysfunction and prepare you for playing the way you want to play. 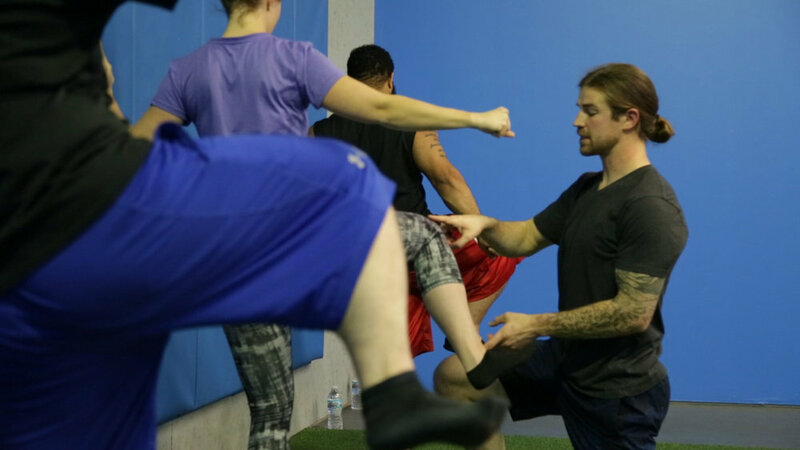 Ben uses the techniques of Functional Range Conditioning (FRC), a comprehensive joint training system based in scientific principles and research, to optimize physical function. Also as a Certified Strength and Conditioning Coach he will optimize your athletic potential. Kinstretch is a movement enhancement system that develops maximum body control, flexibility and usable ranges of motion. Currently used by top professional sports teams, kinstretch serves athletes of all levels and is highly effective at injury rehabilitation and prevention. In a Kinstretch class, expect 45 minutes of intensive mobility work, as your body travels through its full natural range of motion. Van Treese Training will provide a routine and a template you can use every day to self-assess, correct, and maintain quality joint function. Kinstretch is your path to better body control and long-term physical health. I’ve gone to gyms for years and used personal trainers trying to stay strong and ward off aging. That’s when I found the Legends of Park City class. Ben leads the class and wow, what a difference it makes to have a trainer who knows (and cares) about AGING, mobility, adapting to injuries and issues we have from sports and life as well as increasing strength and stamina. With Ben’s help I’ve become a stronger skier using my core to my advantage. I’ve also shaved over 3 strokes from my golf handicap to a 16 by having better control of my swing turn and actually MAKING a turn in the swing. I totally enjoy working out with people who are not competing but having a fun time together getting stronger. Ben adapts every move to what your issues are. He shakes it up so you don’t get bored and makes you groan and then laugh when you see an exercise you aren’t crazy about coming on the list. You improve by upping your weights sensibly. This is one exercise class I want to go to and hate to miss, unless I’m skiing or playing golf and using everything I’ve worked on to get better as I get older. Working with Ben has made such a huge difference in my life. When I started with Ben he took 45+ minutes to go through a Functional Range Assessment. First, he pinpointed what exactly had been bothering me and causing a bunch of other compensation injuries. Second, he formulated a well-rounded, personalized FRC program for me to follow. My shoulders/spine have always bothered me and due to infrequent mobility, stretching, and overuse have gotten worse. Ben was professional and walked me through the assessment each step of the way explaining what he was doing and why. He gave me a 6-week program and access to his movement archive videos and full explanations so I wasn't guessing on what I was supposed to be doing. If I did have a question, he was readily available to chat, text, or email and/or responded back quickly. Three months later, a radical change has taken place. My back seldom bothers me (only sometimes after a particularly hard workout) and for the first time I was able to perform a strict muscle up with full locked out extension at the bottom and full lockout at the top with zero pain. My strength has skyrocketed, and I feel overall better and less achy. If you follow the prescription that Ben gives you, you will feel better, perform better, and sleep better. He is knowledgeable and I highly recommend Ben to anyone who is looking for a longevity approach and a real solution to pain. Like most Park City residents, I am active and have too many outdoor hobbies to name. Years of nagging on-and-off pain in my right shoulder and left hip hindered my ability to enjoy these hobbies on a consistent basis. Through these years, I worked on my injuries with some help from Chiropractors/massage therapists, resulting in only partial and temporary relief. After Ben started working with CrossFit Minerstown, I introduced myself and we discussed my injuries. We started with a formal consult and some mobility testing. After only a few sessions and some prescribed at-home mobility exercises (with video tutorials), Ben was able to help with relief of my injuries. He also took the time to teach me the root cause of these injuries and how I could fix and prevent them myself. Ben's business model is unique in that success is defined by each of his client's ability to be self sufficient after a short period -- no return customers. I feel that I am close to achieving this goal, but for now, I will continue to work with Ben to learn more about how to move appropriately so that I can enjoy all that PC has to offer without fear of re-injury. Thank you, Ben. Over the years I have worked with a variety of trainers. Ben is, by far, the best trainer I have had. His technical knowledge is superb and he works hard to keep us motivated. We are older (67) and have different limitations than younger clients might have. Ben tailors each workout to strengthen our weaknesses and always respects our limitations. Ben is so much more than a workout guide. He is passionate about health and fitness. Ben actively studies fitness. Ben is committed! Best of all, Ben has a warm, caring attitude! I’m not a big fan of gyms, but I look forward to working with Ben. I know that every workout will be fun and productive. I give Ben my highest recommendation. Ben trains out of CrossFit Miners Town in Park City and Massif Athletics in Salt Lake City. Please contact him to make a booking or discuss your needs. Coaches and sports teams can find more information about Ben’s professional services and qualifications here.